Today marks Time to Talk Day, which means we want everyone to have a conversation about mental health. 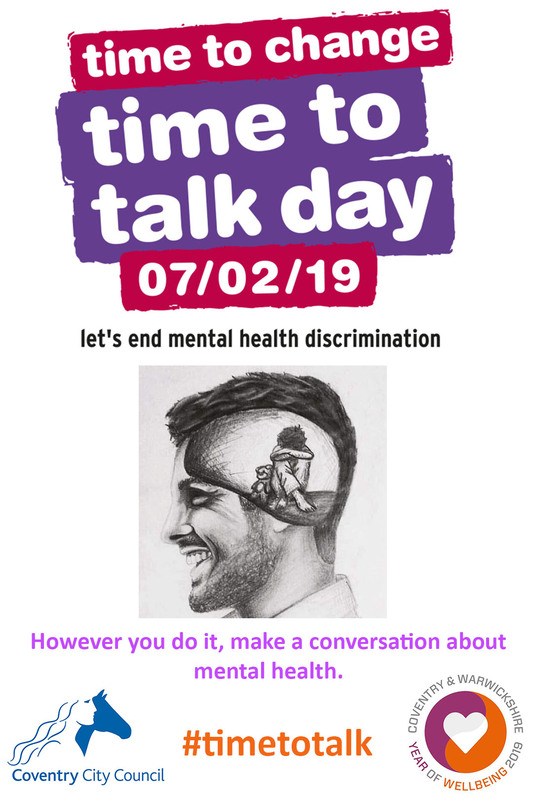 This year’s Time to Talk Day is all about bringing together the right ingredients to have a conversation about mental health. Whether that’s tea, biscuits and close friends, dogs, family and the great outdoors, or a room full of people challenging mental health stigma, we want to get you all talking. Spread the word about what goes into a good conversation by sharing your ingredient selfie on social media using the hashtags: #TimeToTalk and #IngredientSelfie or share a list of your ‘ingredients’ in the comments box. It could be something physical such as, going for a nice walk or cooking a meal, or it could be more of an idea, like not judging others. Don’t forget, the Coventry and Warwickshire Mind Bus will be stationed in Broadgate, in the city centre, between 1pm – 3pm today, so why not take some time out to visit the bus to start your conversation today? Make sure you tell any friends and colleagues that might not know about this! Talking about mental health is not always easy, but starting a conversation doesn’t have to be awkward, and being there for someone can make a huge difference. Having conversations about mental health helps break down stereotypes, improve relationships, aid recovery and take the stigma out of something that affects us all. There are lots of different ways to have a conversation about mental health and you don’t have to be an expert to talk. With it being our Year of Wellbeing, this year too, why not make a pledge to start talking more and opening up about any struggles you may be trying to face alone? Or use this day as an opportunity to make a pledge about something that’s it important to you. However, you do it, make sure you have a conversation about mental health this Time to Talk Day.